Why are there gaps in my window seal? Here's a quick explanation to what they do, and why they're there. 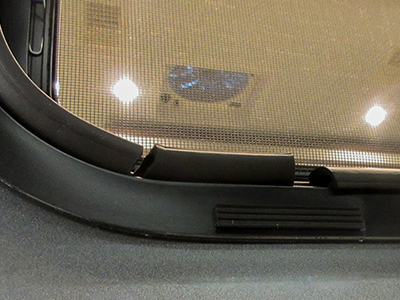 You may have noticed that along the outside edge, there are gaps along the window seal. You may be thinking that something has gone wrong. That maybe they were cut too short or should have been sealed after the fact? Maybe you should bring it in and have the gap sealed, or seal it yourself? Well actually, they are put there on purpose! These gaps are actually there to allow any water built up behind the window to drain freely outside the coach. Without these gaps in the seal, any water or condensation built up inside the window would begin to fill the channel inside the window and, eventually, begin to drip down the interior wall and behind cabinets installed near the window, causing damage to the wall and cabinets over time.